Member event: "Notes from the Past: Music in Gulf South Homes"
This event is exclusively for THNOC members. Admission is free, but space is limited. For reservations, email wrc@hnoc.org or call (504) 523-4662. 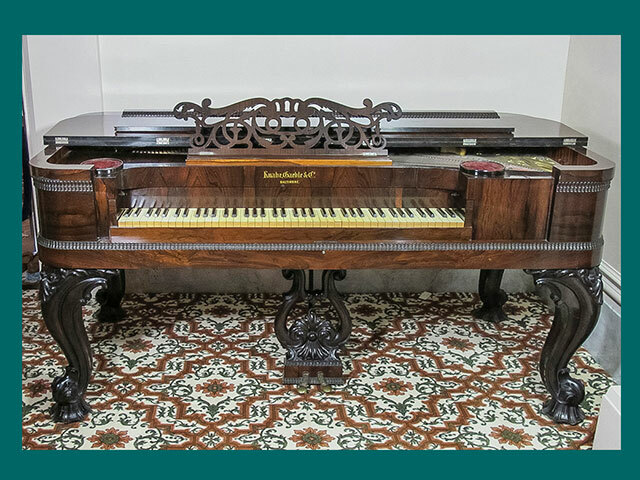 For the second installment of the 2018 Williams Decorative Arts Lectures—presented exclusively for THNOC members—guest lecturer Sarah Duggan, research curator and coordinator of the Classical Institute of the South at THNOC, will examine how 19th-century families brought melodic entertainment into their parlors and will highlight some recent musical finds from from the decorative arts surveys conducted by CIS. Not a member? Join online or call (504) 598-7109 for more information. Saturday, August 18: "Keeping it Cool: Historic Ways to Beat the Heat"
Saturday, October 27: "Mahogany and Bordeaux: The Business and Craftsmanship of François Seignouret"